The Fruit Spiral is an educational/entertainment device that shows a new form of interaction with every-day items- in this case fruit. 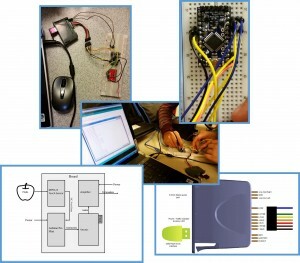 It was created to show how students can use electronics to create an entertaining game using modern technology and programming techniques. One of the goals of the Fruit Spiral was to provide a learning mechanism beyond the simple rote memorization that is normally advocated in schools. *Click on the collages below to see the pictures in higher quality! The finished board at TedX. We had to make do with only one speaker, but everything else worked smoothly. The Day of the event! The day before we spread the tablecloth and set up the PowerPoint. We discovered some speaker problems! The next morning, Rachel brought some speakers from her house, but only one of them worked with the board. The picture is of us chatting minutes before XLabs began (top). We got lucky and ours was the first booth the participants of Tedx saw as they walked into xLabs. Because of this, our bright fruits attracted lots of people. We had a lot of fun explaining our project and Chap Research to them. In the picture, some of the younger attendees came to visit (bottom). Back in October, 2014, the ChapX team (though its members didn’t know what chapX was at the time) had its first meeting. 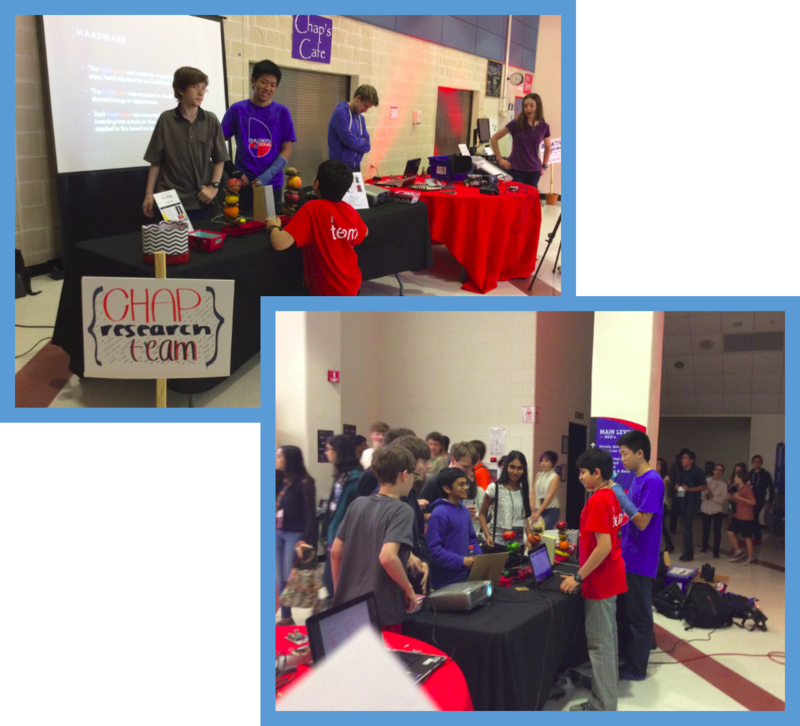 Chap Research was still in its pre-recruiting stages and our original members were ready to take on a new project. We first brainstormed some ideas, which included a building a mini-mill, a quadcopter, some ultrasonic beacons stickers to find lost possessions, and the Fruit Spiral. The Fruit Spiral project was special not only because we chose to do it, but also because it would involve the participation of a guest member, Siddarth Sirinivan (who was a 7th grader at the time), and would give us a spot in the TedX Labs at February 14th, 2014. In the next meeting, we chose the name ChapX and started better defining what we wanted our end product to be. Inspired by fancy hotel services, we created some concept art illustrating three spirals, each nestling fruit inside its curves. After that, we listed the Fruits Spiral’s features in order to get a final idea of the final product (top left). We listed out the different component we would need and divided ourselves into hardware and software teams. 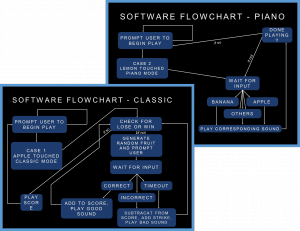 To begin, the software team wrote pseudo code for Spiral, and listed the modes and games we wanted the Spiral to have (right). In order to organize ourselves and make it easier to write code, we used naming conventions for sound files and used subversion. We learned much about programming Arduino, using the touch sensor, and using the Vmusic by reading papers online. 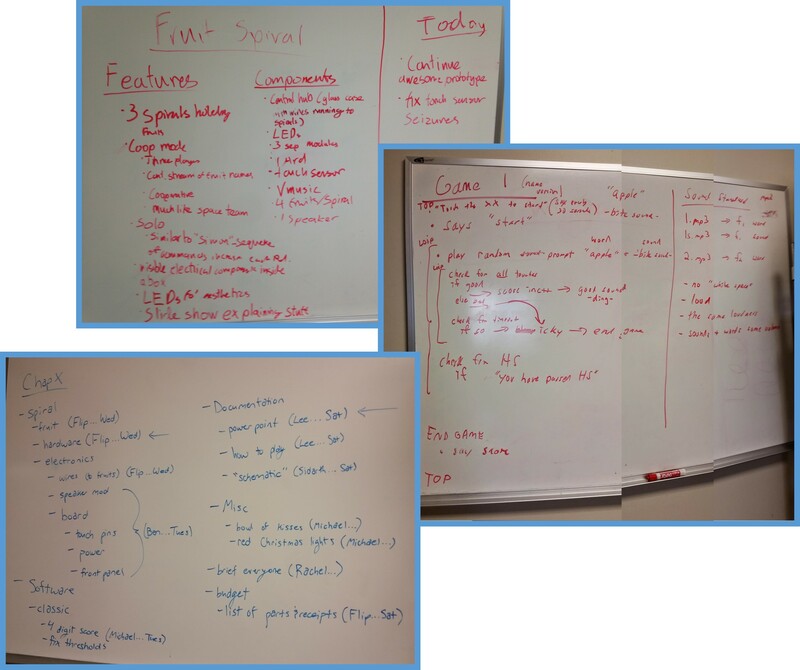 In some of the meetings, to get a solid direction for the team, we assigned specific tasks to each member (bottom left). Michael Huang, as the team lead, was responsible for sending emails with to-do lists and making sure events happen on schedule. One of the first decisions we made was to use an Arduino Pro Mini(top right). This was because we already had extensive previous experience with the Pro Mini from the ChapR project. We used the Spark fun MPR121 as our touch sensor. We chose this sensor because it had all the functions we needed to wire fruit for touch sensitivity. Conveniently, it also had the 12 touch pins we needed for our 12 fruits. Because of its ability to playback of MP3 and other popular sound formats directly from a USB flash device, we chose the VMusic(bottom right) to handle our sound files. The whole board was not built at once. 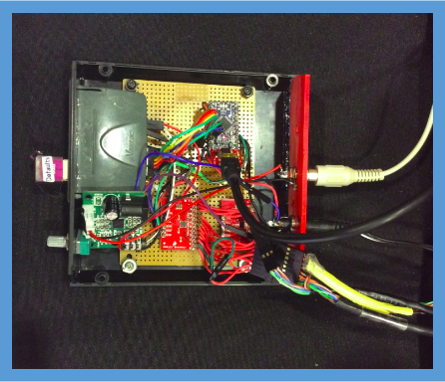 First, we focused on connecting the Arduino to the Vmusic(middle). We looked up the pinout of the Vmusic online and connected pins accordingly on a breadboard. After some programming, we could make the Vmusic play a short “Pirates of the Caribbean” tune after prompted by the Arduino. After that connection was secure, we moved on to connecting the Arduino with the MPR121. Soon, we could get printouts to the Debug stream of the Arduino when pins on the touch sensor were touched. Finally, when both these tasks were completed, we combined the two(top left, bottom left) and began programming the game modes. From the second meeting, we had already decided the design of the spiral. However, the fruits had to be bought fresh so that our audience could avoid touching rotten fruit, and much of the hardware depended on the way we created the board. Because of these reasons and the relative simplicity of the design we began building the Spirals later in our schedule. To create the Spirals, we bend wire clothes hangers using clamps in the school workshop. We then sheathed the clothes hangers in the black cable sheathes our FRC team used and had lying around(right). After that, a dissected Ethernet cable was threaded into the sheathing. Holes were cut into the sheathing to let wires poke into the fruits in the Spirals(left). A look at the logic behind our game modes. 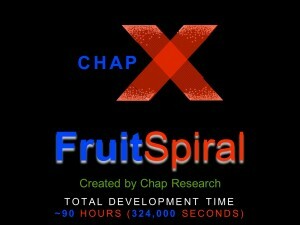 The Fruit Spiral was meant to be an educational project as well as a project that would further the influence of Chap Research on the community. The project has definitely succeeded in both areas, as the skills gained from programming in Arduiono and hardware design sides of the project with inevitably be useful in future projects and undertakings. At the TedX, our booth had a constant stream of visitors and interested people of all ages. From the event we got multiple contacts and multiple potential project partnerships. 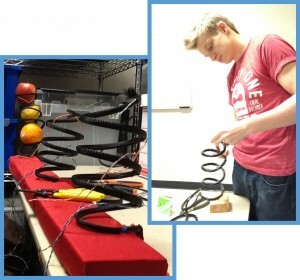 In addition, the process of designing a product, spending months on programming and wiring, and finally seeing the Spiral in action was a truly rewarding and fun experience. Some fields that could have been improved, however, would be more efficient scheduling, and more communication between the hardware and software teams. Leaving more of a buffer time before the Spiral was completed and the event would have been helpful in catching the speaker problem earlier on, and therefore delivering a better experience to the audience. However, considering all the previously mentioned achievements of the project, the Fruit Spiral can be considered a satisfying success.